Koodiyattam is a masterpiece art of Kerala in which Sanskrit dramas are enacted very well. It is believed to have existed before 10th century AD and is the oldest one to be still performed. 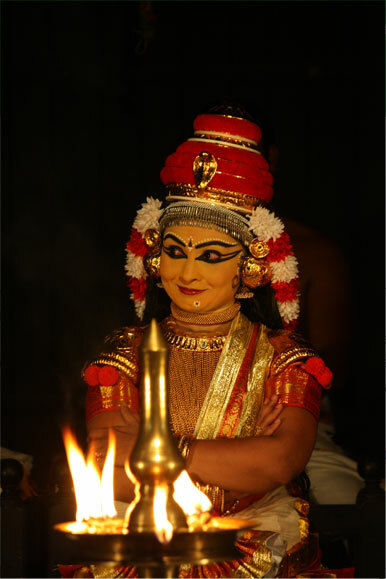 Some measures were taken by Kulashekhara Varman to reform Koodiyattam. As a result of such reforms, Koodiyattam was assumed to have a long history of about 1000 years which makes it the oldest surviving theatre art. The word meaning of Koodiyattam is ‘dancing together’ where this dance is performed by a group of people. As per tradition, the dance was performed by the people belonging to the Chakyar caste. They are the temple dwelling people who are superior groups among the temple servants. They perform this dance form because they consider it as their family duty and so continue to perform this in order to preserve Koodiyattam. The instruments used in this include Mizhavu which is played by the Nambiyars seated at the rear of the stage. The women belonging to this caste enact the women characters and also play the musical instrument Cymbals. They also sing verses of the drama by sitting at the left end of the stage. Some other instruments used include Kuzhal and Conch. But even then most of the Chakyar families have given up these traditional performances. At present there are only few who still maintain this profession. The theme for the Koodiyattam performance is written in Sanskrit and is based on religious and ritualistic topics. The Koodiyattam is performed from a special stage called as Koothambalam which is decorated well with various fruits like tender coconut bunch, plantain plant bearing banana etc. This drama may last for many days and to play a single act in its original form alone may take around 41 days. The play starts at night once the prayers and rituals at the temple are over. The performance gets over the next day morning before the rituals get started. On the first day, an offering is made to the God. Koodiyattam gives importance to facial expressions, eye movements, gestures etc. The main element in Koodiyattam is Abhinaya. There are 4 types of Abinaya namely Angikam which is the gesture, Vachikam by oral rendering of the slokas, Sathvikam and Aharyam which is the use of makeup and costumes. The comic character in this is called as Vidushaka who speak in Malayalam language. When he mixes both Sanskrit and Malayalam together with the intention of making it comical, this gives rise to the Mani Pravalam. The Vidushaka is an ironic foil to the hero because as the hero sings something in praise of his love, the Vidushaka recites to mock it. The main feature of Koodiyattam is the Sanskrit interpretation using slokas, the hand gestures made by the characters and the oral recitation of the Vidushakas. At present, the Koodiyattam play is not presented fully and is performed as parts. At a time one performance called as Anka is done. So an introductory performance of the Koodiyattam called as Nirvahana is done. In this performance a character says a summary of the earlier acts and it may take several days to complete it. If the Nirvahana is done by a Vidushaka it is called an oral exposition whereas all the other characters render it through hand gestures.